SANTA MONICA, Calif., October 11, 2018 – ​​BudTrader CEO Brad McLaughlin traveled to Washington DC September 27 and 28 to meet with lawmakers and Republican leadership. The purpose of McLaughlin’s visit was to discuss the current status of the legal cannabis industry, as well as potential reform, and to raise the profile of an emerging industry of cannabis professionals. McLaughlin was invited to Washington D.C. by Southern California Congressman Dana Rohrabacher, who supports cannabis legalization for both medical and recreational purposes. “I invited Brad McLaughlin out to Washington because he is a terrific leader in the incredible, emerging, cannabis industry. 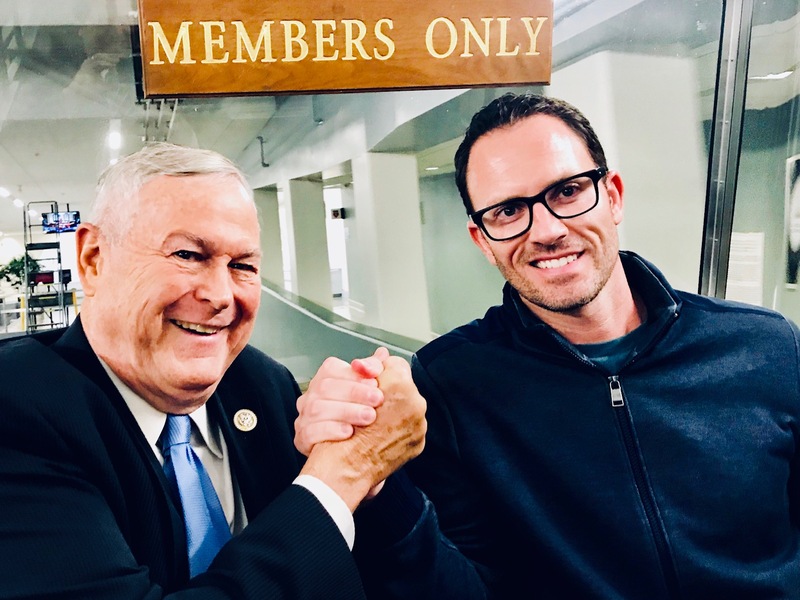 He’s one of only a handful of Cannabis entrepreneurs that has the expertise and sophistication to bring the level of professionalism that is needed when meeting with some of the most conservative members of Congress,” said Congressman Rohrabacher. Following his meetings on Capitol Hill, McLaughlin attended an NRCC fundraiser where he met President Trump, Secretary of Energy Rick Perry, and many more Republican members of Congress (the entire Republican Congressional Delegation was invited). In my meetings with members of Congress, I continually stressed that we could create jobs, lower crime, generate tax revenue for schools and infrastructure, fight opiate addiction, help our honored veterans, take carbon out of the atmosphere, remove toxins from our soil and create a second gold rush or 'green rush' for American farmers and entrepreneurs by legalizing cannabis. “In my meetings with members of Congress, I continually stressed that we could create jobs, lower crime, generate tax revenue for schools and infrastructure, fight opiate addiction, help our honored veterans, take carbon out of the atmosphere, remove toxins from our soil and create a second gold rush or ‘green rush’ for American farmers and entrepreneurs by legalizing cannabis,” said McLaughlin. McLaughlin says he saw that Republican lawmakers were receptive to his calls to end cannabis prohibition. “I did not experience any kind of negativity for being the CEO of a cannabis technology company. Republican leaders were open-minded, cooperative, friendly and engaged in our meetings. They asked a lot of great questions and had a lot of great ideas. I feel like some major policy changes are on the horizon for cannabis,” said BudTrader CEO Brad McLaughlin. BudTrader.com is the largest online cannabis marketplace. Its platform is available in 31 states where cannabis use is legal, as well as Canada and Puerto Rico. BudTrader has two million registered users who safely and legally post and reply to classifieds-style ads for cannabis products, services, jobs, equipment and more.